Thailand is an undeniable favourite for a beach holiday; their beaches are beautiful, the pound goes far, and the weather is almost always good. But as the islands are becoming more and more popular with tourists, Thailand’s eastern neighbour Cambodia, is becoming more appealing – and proving that it’s a destination that has more to offer than temples. The most well-known Cambodian beach is Serendipity Beach in Sihanoukville, and this is what can put a lot of people off considering Cambodia as a beach destination. I’ll be honest - it’s the Benidorm of the country, and if you’re looking for cheap drinks and lots of partying with backpackers then this is the place for you. However, if you’re looking for a relatively unpopulated paradise, then I recommend visiting one of the following beaches. Otres stretches along the Cambodian coastline, and is made up of two main areas - Otres 1 and Otres 2, which enjoy roughly a kilometre of undeveloped and empty beach between them. Found just 15 minutes down the road from Serendipity Beach, Otres is much quieter and more laid back than its busy neighbour, and while both are pretty small, Otres 1 has around 50 guest houses. Most of the guest houses there are run by locals who have an agreement to turn the music off at 10pm every night, and from your sun lounger on the beach you can watch some of the best sunsets in the world with just the sound of the ocean. 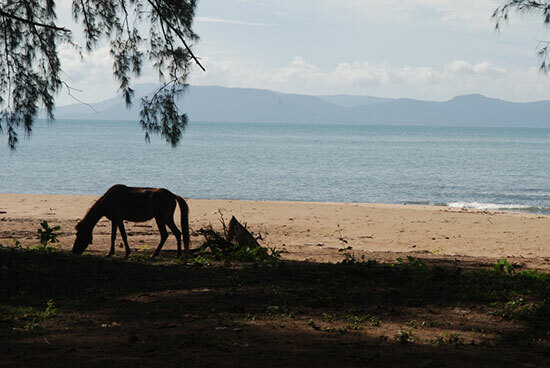 From Sihanoukville you can head over to one of the islands, the most popular being Koh Rong. The island is untouched in a way that makes you feel like you really are one of the first people to discover it, and better yet there are 27 miles of beach around the island to enjoy. If you head to Long Set beach, you will be met with 2.5 miles of dazzlingly white sand and barely a person or building in sight. If you’ve ever wanted to feel like you own your own island then this is the place to live out that dream. Long Set beach is also where you can experience swimming with luminous plankton at night, an experience you won’t forget in a hurry! Koh Rong Samloem is another Cambodian island to rival that of Thailand's. On the east of the island is where you’ll find Saracen Bay, the most developed area on the island with a fast growing range of accommodation from eco-friendly tents to high end luxury. 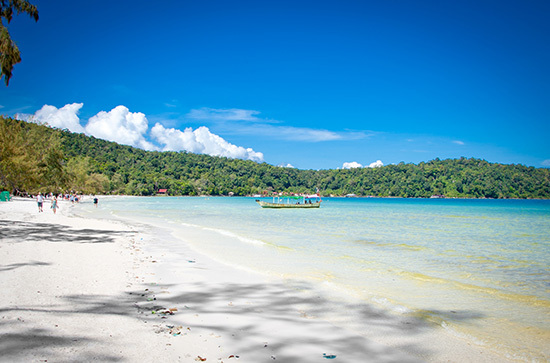 Just like Long Set Beach on Koh Rong, Saracen Bay is a site for sore eyes with white sand and perfectly clear water. The island is definitely becoming more popular with tourists, but compared to the busy Thai islands, you’ll feel like you’ve got the place to yourself. Possibly the most untouched and flawless of the islands in Cambodia,, Koh Thmei only has a few families who live there, and accommodation is very limited (as in, there is only one choice). While there aren’t many people to be found, the island is home to a variety of wildlife including over 150 types of birds. If you want to stay overnight, then it will be at Koh Thmei Resort, set on a beautiful beach offering sea-kayaking and snorkelling. The bungalows are very simple, and use solar-power and biofuel for electricity, and the resort will organise your pick up from Sihanoukville to make getting their nice and simple. 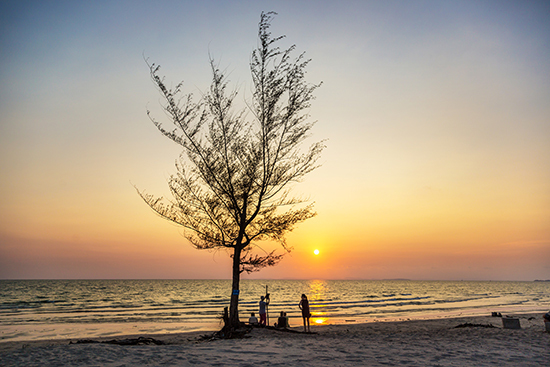 Visit some of Cambodia's beaches via a tailor-made holiday from our Experts. For itinerary and price ideas, be inspired by our Cambodia holidays online. A mid-twenties travel addict, currently living in London after leaving NZ on a one way ticket back in 2012. Since leaving home I’ve worked at a summer camp in America, been a tour guide in 14 countries across Europe, and done two backpacking trips through Asia.